Are you preparing to start a new business or launch a new product/service? The name of your new startup is one of the most important variables that could greatly influence whether your project will succeed or fail. While a great business name has always been important it’s absolutely essential in today’s Internet connected marketplace. How will your market perceive your proposed business name? How do they react to existing similar domain names? Take note of the leaders in your industry and the domain names they use. Assemble a focus group. Assemble a group of current/perspective customers, employees and industry contacts. This can be done in person or online. Ask them about what industry specific domain names they like, and find out why. Ask them about any ideas you have for your name without steering their answer. Take note and honestly consider their feedback. 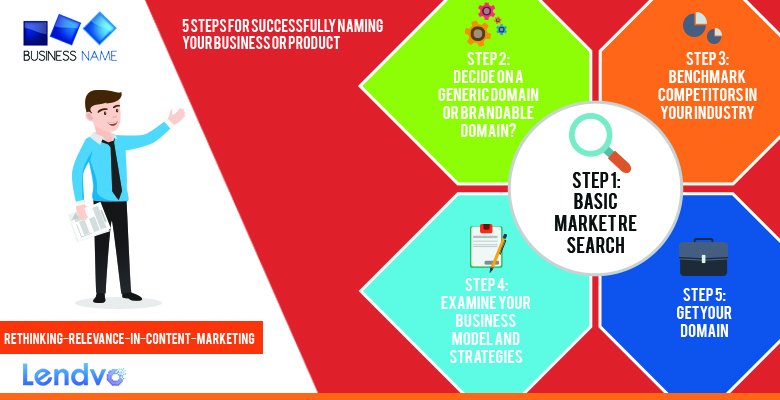 Step 2: Decide on a Generic Domain or Brandable Domain? A generic domain name makes use of an industry term or keyword, such as Cars.com while a brandable domain is unique word that is not commonly found in language and do not have a specific meaning like “Google.com”. A brandable domain name takes more time and resources to fully develop. You will need to put resources into a comprehensive marketing strategy to build meaning into the name. However, once built, a branded domain name is immensely powerful. I can’t stress enough that even if you decide to go brandable domain please don’t settle for something that’s difficult to spell or remember. Generic domain names are easier to brand in the beginning. They immediately tell a prospective customer about your business. Additionally, having a domain name that matches a search query may provide search engine ranking benefits. Both brandable and generic names may have strengths and weaknesses when it comes to your specific situation. Consider the above contrast before deciding which route to take. Be aware of existing trademarks for various terms and keywords. Registering the domain name of an existing trademark can result in confiscation and possibly further legal action. Does your prospective name sound like a competitor’s name (without violating a trademark)? If so, is this good or bad? If done carefully and tastefully, this can catalyze growth. Consider leveraging naming elements of a well-known brand. You can derive certain characteristics of popular brands and use them in your domain to convey similar perceptions. For example, iAquire.com uses the signature ‘i’ from many Apple branded products like the iPhone and iPad. As such, some consumers may immediately associate the iAcquire name with techiness and high product quality because they also associate those traits with iPad. An ideal business domain name will integrate seamlessly with your upcoming growth and marketing strategies. It will also exemplify your business model and mission statement. Consider the Unique Selling Proposition (USP) of your product line or service. What domain name best emphasizes your USP? If someone who knows nothing about what you have offer sees your domain name, will they have a rough idea what makes your business special? What future marketing initiatives do you have planned? How will a prospective name fit in with those initiatives? You must consider logos, your website, social media campaigns and any print material. While you may be in a rush to secure a domain name, take time to consider each of the above factors. After you have arrived at a few name ideas it’s time to make your purchase. If you’re in luck, you’ll be able to simply register the name. More than likely, however, you will need to buy an already registered domain. You can follow our tips on how to buy a domain name in the aftermarket and get the best deal possible!